Apple has built its reputation for preserving users’ privacy is by putting CEO Tim Cook at the forefront. Cook’s thought leadership has been apparent in myriad op eds and interviews, having recently penned an article for TIME on how users can act to take their privacy back from bad actors. There’s no question a well-written missive from the C-Suite can make or break company reputation and goodwill with stakeholders. Here are three ways to get it right. Each year, PR News celebrates its list of Top Women in PR, an elite group of communications professionals who have spearheaded highly successful campaigns and initiatives in recent months. They’ve also mentored colleagues, made innovative changes to their team structure and ideated some of the most creative PR plans in the business. What does it take to be a Top Woman in PR? PR News sat down with honoree Christin Baker, director of public affairs at SoftBank Group, to find out. What does it take to be a Top Woman in PR? PR News sat down with 2019 honoree Kristina Adamski, vice president of corporate communications at Nissan, to learn about her approach to media relations and hear her top pointers for aspiring female leaders in the field. In the last few weeks, AOC has seen a high school video go viral (and combated the backlash), been interviewed on “60 Minutes” and has collected myriad headlines in top-tier publications. In other words, she’s a PR professional’s dream, racking up consistent wins in the mainstream media and on social. So how has AOC come to dominate the digital space? Here are 3 ways the politician is leveraging communications best practices to grow her digital footprint and own the news cycle. For communicators, the Defense Department’s recent Twitter gaffe smacks of a common issue: How can regulated industries—like defense, for instance—inject humor and fun into their social media presence without taking unnecessary risks? Luckily, there are a few steps PR professionals can take to ensure their brands’ tweets don’t land them in hot water in 2019. The brands on Spotify’s “The Year in Advertising” differ, but they all have one thing in common: They leveraged Spotify’s unique insights into user behavior to target audiences where and when they listen. Spotify has amassed a vast collection of data over the years, having integrated with other personal data collectors like Facebook and Instagram. Here are three highlights from the 2018 list, along with the user behavior insights behind each campaign. PR News’ 2019 Top Women in PR will be celebrated at a luncheon ceremony on Jan. 25 at the Grand Hyatt in New York City. 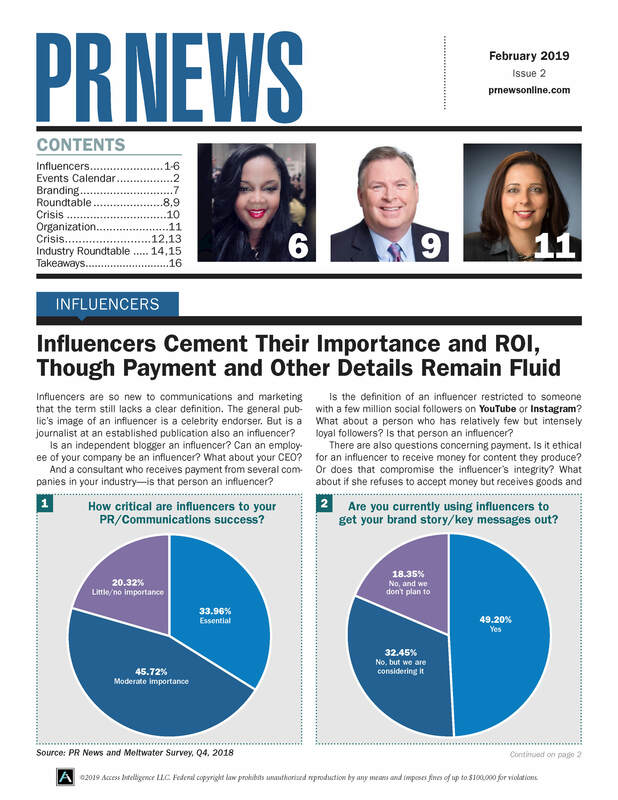 Winners were judged based on their campaign objectives, successes and ROI over the last year, as well as their overall influence within their organizations and the PR profession at large. Prada is in hot water after releasing a product that many on social media are calling racist. The company has issued a statement in response and removed the product from its shelves. But how can it—and other brands—avoid making the same mistake in the future? Entering for industry awards is often a major part of PR professionals’ work, but it poses significant challenges. How do you ensure your entry copy will stand out among a slew of other awards entries? And how to best discern exactly what judges are looking for? Lucky for you, the PR News editorial team judges its fair share of industry awards each year, and offers up the following tips for strengthening your industry awards entries. Social video may be the preferred form of content for digital natives, but that doesn’t mean it comes cheap. From hiring a freelance video crew, to pre- and post-production costs and boosting the content on social media once it’s finished, even a minute-long video can give senior leaders sticker shock. So how best to convince your management that great video content is what your brand needs to make its next campaign succeed?